I bought one of those new orange frying pans. Wow, it's a dandy! Nothing will stick to it. Eggs? No problem...even without oil or Pam! O R A N G E ! ! The left has compared President Trump to a Cheeto because of the orange color. It slides right of the President. They accuse him of conniving with the Russians, it slides right off. They accuse him of bigotry and it slides right off. Rachael Maddow tries to make something of his illegally acquired 2005 tax return, and it not only slides off, President Trump even appears better for it! There is a popular series on a premium channel called, Orange is the New Black. Maybe it is. I love my orange frying pan, and I love my orange President. Nothing sticks to either of them. I have given up trying to find something that will stick to my orange pan. 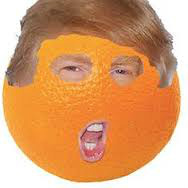 I think it is time the left gives up trying to find something that will stick to our orange President.